Chow Yun-Fat is Confucius in, uh, Confucius. The Skinny: Competent but uninspired biopic about the legendary Chinese philosopher. Chow Yun-Fat brings the star power, but director Hu Mei misses many opportunities to make this a truly compelling look at a worthy and largely unexplored subject. In a small supporting role, Zhou Xun is predictably pretty damn good. 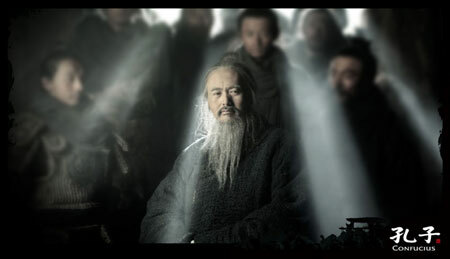 by Kozo: He may be dubbed, but Chow Yun-Fat brings strong, charismatic presence to the title role in Confucius. However, the passion that best serves the actor is rarely given display, as director Hu Mei chooses to tell Confucius' tale in an overly reverent and unimaginative manner. Framed as a dying memory by the aged Kong Qiu (Confucius' real name), the film depicts two key periods in his life: his time as a politician in the State of Lu, and the subsequent 14-year period when he and his disciples traveled the land to offer education to the unwashed masses (read: upper class snobs). During this first portion, high-handed doubletalk and backroom political machinations make up the majority of the tension. Confucius is portrayed as a principled and righteous man who challenges against the corruption and cruelty rampant in government. Unsurprisingly, those in power want him gone. Maybe. The relationships are convoluted and tricky, with some clear villains and some also stuck on the fence. Clan leader Chi Shun (Chen Jianbin) plays both ally and enemy to Confucius, inscrutably plotting against him while also seeming to genuinely value his character and initiatives – that is, when they don't conflict with his own. Throughout these political tensions, we learn about Confucius' life, his values of benevolence and moral thought, and his relationships with his family and admiring students. This first part of the film is effective if a bit talky, and adequately sets up the character's eventual fall from grace. Ultimately, Confucius realizes that he's not able to swim with the sharks, and sends himself into self-exile when his political life comes falling down. He abruptly leaves his family and home, turning to the road with only his disciples giving him support.